Shot at a body weight of 320 massive pounds, Art will personally take you through full and complete workouts for every muscle group. Learn all the tricks, secrets and priceless information to get a massive, hard and ripped body! It’s all here! Everything you need to know about building lean muscle as fast as humanly possible! No more guesswork! Save yourself years of frustration and thousands of dollars by learning everything the BEST way! TAKE YOUR PHYSIQUE TO THE NEXT LEVEL! 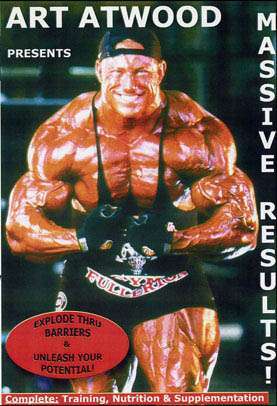 GET MASSIVE RESULTS! – Shot at a body weight of 320 massive pounds, Art will personally take you through full and complete workouts for every muscle group. – You’ll discover how many sets, repetitions and exercises are ideal for rapid gains in size and strength. – Find out which exercises build each muscle group the fastest and maximize your time in the gym—this is a HUGE secret to Art’s success! – See Art’s advanced training techniques to literally force your muscles to grow! – Art will take you through his kitchen where you’ll learn EXACTLY what to eat and when for maximum muscle recovery. – Supplements are an ATOMIC BOMB when it comes to blowing up your muscle gains. Art will tell you precisely what you need to take and when to take your supplements to effectively repair and rebuild muscle tissue. – Art also included some contest condition posing, fat loss tips and much more! You get Art’s 18 years of knowledge, techniques and experience all in a 2 hour DVD! 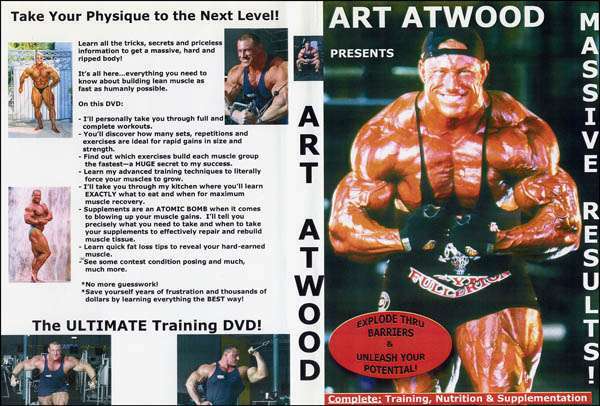 This is Art’s first training DVD. Tribute to Art Atwood who passed away September 11, 2011.